The Grand Cherokee is the most awarded SUV on the market and based on the 2018 lineup it looks like it is going to stay that way. The 2018 Grand Cherokee lineup has two new trims and more options than ever. The 2018 Jeep Grand Cherokee lineup consists of 11 models and the trims new to the 2018 model year are the 2018 Grand Cherokee Trackhawk and the 2018 Grand Cherokee Sterling Edition. The new Grand Cherokee Trackhawk is a record-breaking Jeep that brings performance to a new level, and the Grand Cherokee Sterling Edition is a special-edition 25th Anniversary model. Of the eleven Grand Cherokee trims, three trims (Grand Cherokee Trailhawk, Grand Cherokee SRT, and Grand Cherokee Trackhawk) are only available with a 4×4 drivetrain, and the other eight Grand Cherokee trims are available with a 4×2 or a 4×4 drivetrain. Now more diverse than ever, the 2018 Jeep Grand Cherokee lineup includes four engines and they each give the Grand Cherokee unique benefits. The standard engine on the eight 4×2 Grand Cherokee models is the 3.6-liter V6 engine and it produces 295 horsepower, 260 lb-ft of torque and gives the Grand Cherokee a maximum towing capacity of 6,200 pounds. When equipped with the 3.6L, the Grand Cherokee averages 19 mpg in the city and 26 mpg on the highway, which makes the 3.6L engine the most fuel efficient engine option. The same engine comes standard when the Grand Cherokee has a 4×4 drivetrain, but buyers have the option to upgrade Grand Cherokee 4×4 models (except Grand Cherokee SRT and Grand Cherokee Trackhawk) with the 5.7-liter HEMI V8 engine. The 5.7-liter HEMI V8 engine increases the Grand Cherokee’s power to 360 horsepower and 390 lb-ft of torque. Thanks to the extra horsepower and torque produced by the 5.7L engine, the Grand Cherokee’s maximum towing capacity is 7,400 pounds, which is the highest towing capacity available on the Grand Cherokee. The available 6.4-liter HEMI V8 engine is only available on the Grand Cherokee SRT, which is a performance Grand Cherokee that was first produced for the 2012 model year. The 6.4L engine produces 475 horsepower, 470 lb-ft of torque and has a towing capacity of 7,200 pounds. Built for performance, the Grand Cherokee SRT has a top speed of 160 mph and it accelerates from 0-60 mph in 4.3 seconds. New to the 2018 lineup is the supercharged 6.2-liter HEMI V8 engine and it is exclusively available on the new Grand Cherokee Trackhawk, which is the fastest SUV ever. Similar to the supercharged 6.2L engine found on Dodge SRT Hellcat models, the supercharged 6.2L on the Jeep Grand Cherokee Trackhawk produces 707 horsepower and 650 lb-ft of torque. The Grand Cherokee Trackhawk has the ability to smoke any SUV competitor on the track because it accelerates from 0-60 mph in 3.5 seconds, completes a quarter-mile in 11.6 seconds and has a top speed of 180 mph. The Grand Cherokee is available with several exterior features and options, and that makes it easy for buyers to get what they want and need at a price that fits their budget. As a member of the Jeep family, the Grand Cherokee has the iconic seven-slot grille that everyone knows and loves. Some of the exterior features on all Grand Cherokee models include a tinted windshield, tinted front glass, a rear window wiper and rear window defroster. Also, since the Grand Cherokee is a vehicle built for adventure, all Grand Cherokee trims come standard with a spare wheel just in case anything happens to a tire while exploring off the beaten path. To optimize all of the power produced by the engine, the Grand Cherokee SRT and Grand Cherokee Trackhawk are equipped with performance features. Both models have advanced cooling features as well as a more aerodynamic design and a rear spoiler on the liftgate. The Grand Cherokee performance models also have five drive modes that change drive settings for certain scenarios and conditions. The five drive modes include auto, tow, track, sport and snow. Also, the Grand Cherokee SRT and Grand Cherokee Trackhawk have a launch control button and when pressed the vehicle prepares the transmission, suspension, driveline, engine and stability control for launch, and that results in an improved and more consistent straight-line acceleration. Introduced for the 2017 model year was the Grand Cherokee Trailhawk and in 2018 it is still the most off-road capable Jeep Grand Cherokee model. Like the other Trailhawk trims available on other Jeep models, the Grand Cherokee Trailhawk is a Trail Rated model that’s equipped with some helpful off-roading equipment like two red tow hooks in the front and one red tow hook in the back. The Grand Cherokee Trailhawk rides on 18-inch Goodyear Adventure off-road tires and to protect the most important vehicle components from being damaged by water, debris or rocks when off-roading the Grand Cherokee Trailhawk is equipped with several skid plates. The 2018 Jeep Grand Cherokee is a spacious four-door, five-passenger full-size SUV and it is known for luxury. Interior features range from cloth seats to Nappa leather seats and all Grand Cherokee trims have a 60/40 split rear folding seat, so it’s easy for users to create extra trunk space for cargo when needed. Five Grand Cherokee trims come standard with heated front seats and four trims come standard with heated front seats and heated second-row seats. Additionally, three Grand Cherokee trims come standard with ventilated seats, and that is an available option on other trims as well. All Grand Cherokee models come standard with an overhead console, and a full length floor console for extra storage. To ensure no one is too hot or too cold during a long ride, the Grand Cherokee features a dual-zone automatic temperature control that makes it easy for back seat and front seat passengers to set the temperature they want. One of the most loved features available on the Grand Cherokee is the CommandView dual-pane panoramic sunroof, which lets in a lot of light and creates an open air feeling within the cabin. To keep the Grand Cherokee up-to-date with all of the latest tech, all 2018 Grand Cherokee models have a 7- or 8.4-inch touchscreen, Uconnect 4.0, integrated Bluetooth voice command and a backup rearview camera. The Grand Cherokee comes standard with several auxiliary power outlets, so the driver and passengers can conveniently keep all of their mobile devices charged on their journey. A 6-speaker sound system comes standard, but there are a few different available audio systems, including a 19-speaker audio system. Buyers that want their Grand Cherokee to have the ultimate entertainment setup, the Grand Cherokee is available with a rear seat video system that users can use to watch movies, play video games and listen to music. The Jeep Grand Cherokee is a safe and reliable SUV that has more than 70 advanced safety features. All Grand Cherokee models come standard with advanced multistage airbags, supplemental side-curtain airbags, supplemental side-curtain front and rear airbags, and supplemental front seat-mounted airbags. The standard rain brake support and ready alert braking are small conveniences that go a long way. Buyers that want their SUV to have the most advanced safety features have a few options. The Grand Cherokee is available Parallel Park and Assist, which can actually parallel park the vehicle, as well as Adaptive Cruise Control with Stop, a system that will slow or even stop the Grand Cherokee if the vehicle in front slows down or stops. Hollywood Chrysler Jeep is located just outside of Miami, and we have a great selection of Chrysler and Jeep vehicles. 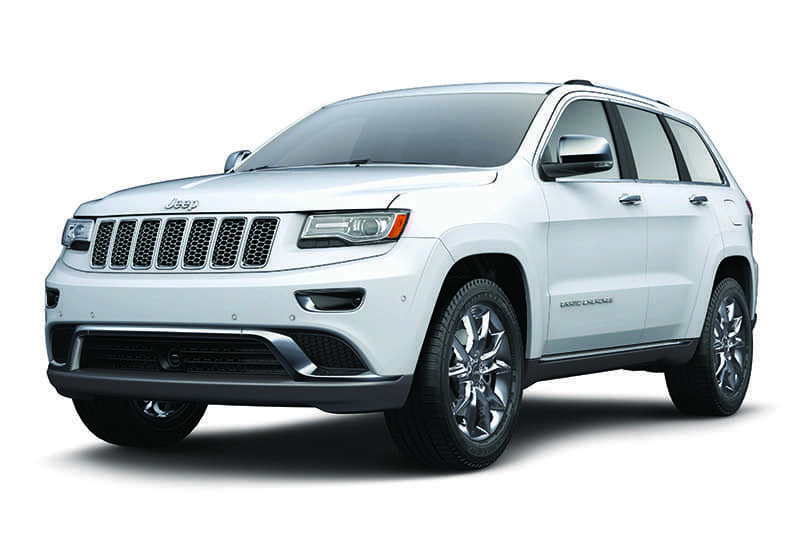 Visit us at Hollywood Chrysler Jeep for a test drive of the brand new Jeep Grand Cherokee today.